The Ohio State defensive line was long thought as one of the better units to start the 2018 NCAA football season. After two weeks of action, it’s clearly apparent those preseason beliefs were not just pulled out of the sky. In fact, the Ohio State defensive line, led by our No. 1 player this preseason Nick Bosa, is the best defensive line in college football. 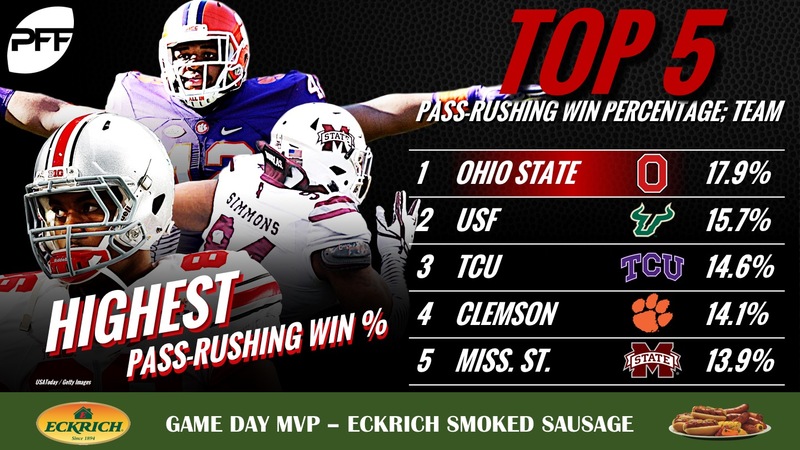 This Ohio State defensive line breakdown is brought to you by Eckrich, the Official Smoked Sausage of the College Football Playoff. The only caveat to their success, however, is that they have been so dominant, we’ve yet to see them on the field for an entire game as the starters have been allowed to rest and the depth players have seen the field for extensive amounts of time. No OSU defensive lineman has accumulated more than 46 pass-rushing snaps this season yet they have four defensive linemen with at least three pressures while three of those have recorded at least seven. Sophomore edge defender Chase Young leads them all with his 11 pressures as he’s recorded two sacks, three QB hits and another six hurries on just 37 pass-rushing snaps. 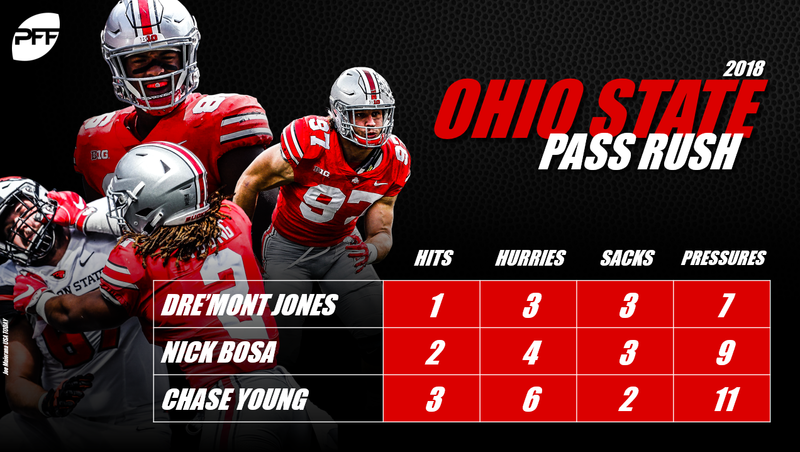 The aforementioned Bosa finds himself second on the team, bringing down three sacks, two hits and four additional hurries, on a team-high 46 pass-rushing snaps. Bosa has won a whopping 34.8 percent of his pass-rushing reps, well above the national average. And while seven pressures don’t seem like a lot, when you consider it’s come from the interior of the defensive line where double teams and chips are common practice, Jones’ numbers are that much more resounding on just 44 pass-rushing snaps. Individual performances aside, what may be even more telling of their success this season, is their work as a unit. Together they’ve won 17.9 percent of their pass-rushes, a clear 2.2 percentage points higher than the next closest FBS team. They’re second behind Michigan State with 21 passes batted at the line of scrimmage and third in the nation with nine collective sacks. At the end of the day, Ohio State’s 84.7 pass-rush grade as a unit is leaps and bounds above the rest of the country as the second-best team in terms of pass-rush grade is Buffalo at 78.7.